Before you proceed, you should know that, your Android should be rooted, have installed Custom Recovery CWM or TWRP and also you should have enough storage on your device to save the Nandroid Backup image file. 1. First of all, you need to enter your device into Recovery Mode, If you’ve ROM Manager installed, then open it and tap the Reboot into Recovery Option and within a few seconds you’re in recovery mode options. Or you can also manually reboot into recovery mode. 2. Once in the recovery mode, use your Volume Up/Down keys to Navigate through different options and Power button for selecting Options. 3. 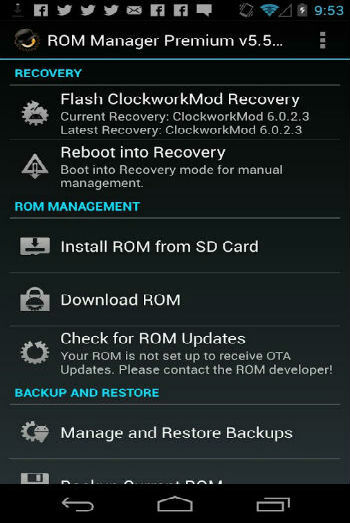 Now navigate to Backup and Restore and select it. Then further select the Backup option. Note your Nandroid Backup file location, so that later you can navigate and access through. 4. Depending on your data and device, it can take time, so have patience while it creates a Nandroid backup for your Android. 5. Once it gets completed, go back and choose to Reboot System Now and you’re done. Now it is recommended that you keep the Nandroid Backup image file to another safe place as well, for that your Laptop or PC is the best option, so connect your Android device to the PC. You may later, want to Restore your Nandroid Backup image file, Restoring Nandroid Backup is almost similar, but then I will guide you through step by step instructions to make it easy and understable for you. 1. Like before just Reboot your device into Recovery Mode. 3. As I said earlier, depending on your device and data it may take some time to Restore so have some patience. Once it gets completed, reboot your device. That’s it folks, I tried my best, to make more easy to understand especially for newbies, Hopefully you’ve learned,‘How to Nandriod Backup and Restore it on any Rooted Android device’, still, if you’re confused at any step let us know in the comment section, for more support and help. How about Sharing it! !